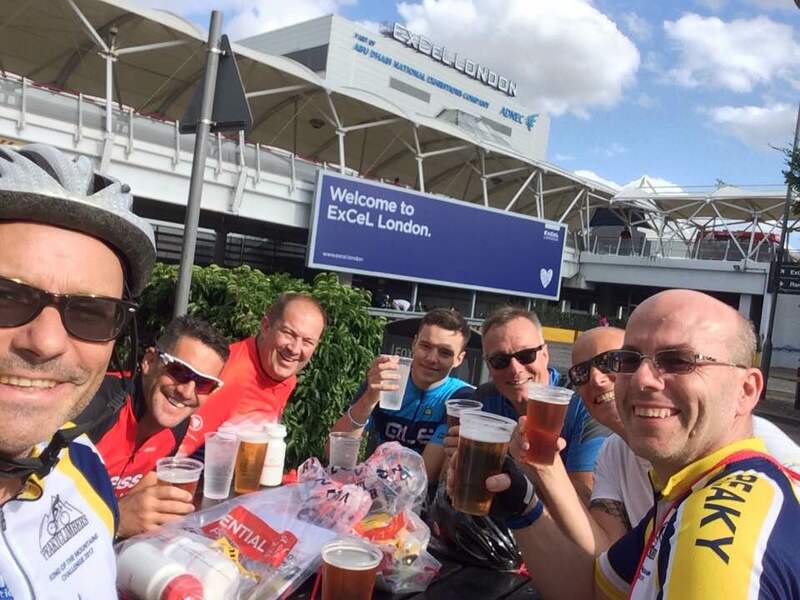 For the second year running, thanks to the Caring Cancer Trusts ballot tickets, the Peaky Climbers participated in the flagship of UK cycle sportive calendar had arrived ‘Ride London 100’. 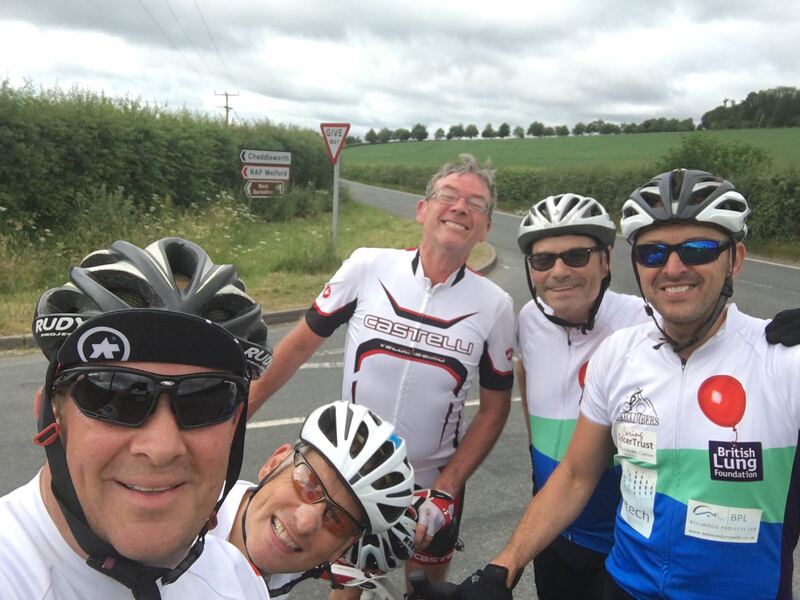 Unfortunately, neither Hinge nor Bracket could make it this year and Robbo pulled out through injury so we had 3 awesome guest riders, Mark Ormrod, Neil Jones and Ollie Burton, JB’s nephew! All the guys set off to the Capital to take on the Olympic road race course made famous in 2012, heading for our usual weekend base camp at the amazing Lesley and Nigel Burton’s amazing house in Islington with the usual amazing welcome and oh so kind hospitality. We headed off to the excel as usual for registration. Once complete the cyclists then returned to base camp through a chilly London, with rather aggressive drivers not showing their appreciation for us 2 wheeled folk! A wonderful evening of food and drink ensued and with spirits high each of the team headed off to wed way before midnight in dread of their 4am alarm clocks sounding! The weather was planned to turn wet overnight, the outlook was bleak. This coupled with the fact an all night party was happening around the corner meant some of the guys had literally only 2 hours kip! 4am arrived and the Peakies were treated to a quality breakfast spread as always. With water bottles filled, race numbers fitted and last minute checks the Team headed off on their bikes in the drizzle for a 6 mile ride to the Queen Elizabeth Olympic village start location. Last year we all managed to sneak into the same starting pool. This year was the complete opposite. 5 into one start group, 3 of the guys were not let in, no matter how much space was available, and there was plenty, so they dived off and started in the group behind. We agreed to rendezvous at pall Mall. Still fairly dry at this point, after the meet and the morning team photo, we all headed off. JB, Neil, Simon, Ben and Ollie were on very good form and set off at a superb pace. Allen, Ormy and Macca stayed together, Allen was struggling with the cold and fitness. As we hit Richmond Park the heavens opened. Horrendous wind and rain, after the summer we have had, it was so unfortunate to have this weather thrown at us today. Awful, awful, awful. It was clear that Allen wasn’t on top form and he decided to peel off and do the shorter route. Ormy and Macca continued to ensure they kept warm, as Ormy only had his cycling jersey to protect him from the elements. It was tough going. No doubt about it. We all cycled into a headwind for the first 60 miles, crazy. The crowds that braved the weather were as always were fantastic, shouting and clapping encouragement all along the 100 mile route which was hugely inspiring. Dorking was packed with people and the Peaky Climbers ‘whipped’ up the crowd as we cycled past – much hollering and cheering – fantastic experience! We flew into Kingston and spotted the British Lung Foundation entourage whereby all the Peaky team slowed up, cheered, shouted and raised fists aloft in celebration…the BLF team were fantastic in their support, even shouting “Come on Peaky Climbers” as we flew by! The biggest issue of the day was when Simon’s brakes failed. The last 20 miles he had no brakes, even the team at the mechanic stop couldn’t fix them…so each time he had to slow down he unclipped and stuck his heels into the road to try and slow him down. Scary, but very funny has a shot past us when we pulled over, Simon eventually stopping 50m down the road. After the cheeky last elevation at Wimbledon Village the boys now pushed on, speeding rapidly to the finish line. 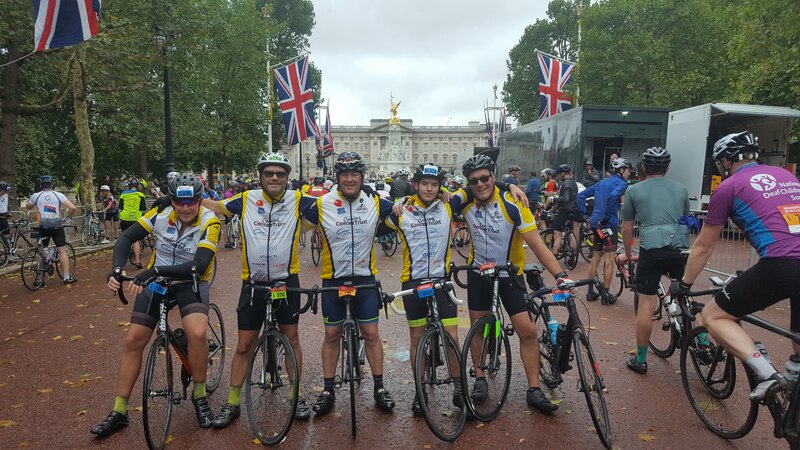 The team cycled through Putney and onto the Embankment then finally onto the Mall, with the finish line in sight. All the boys lined up as a team of 8 and crossed the line as one, again.